See the App Inventor Extensions document about how to use an App Inventor Extension. For questions about this extension or bug reports please start a new thread in the App Inventor Extensions forum. Thank you. For feature requests please contact me by email. To be a sponsor of a new method already is possible starting from only 10 USD! With your contribution you will help the complete App Inventor community. Thank you. Jan 28th, 2019: Version 2: SDK 26 update: POP3 functionality removed, dangerous permission WRITE_EXTERNAL_STORAGE, which was used for POP3 removed. What is a dangerous permission? This extension enables you to send an email via SMTP. 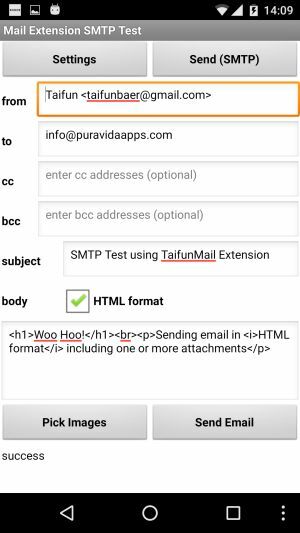 You can send to several To, Cc or Bcc addresses, add several attachments and send in plain text or HTML format. Note: SMTP authentication is set to true. To use this extension together with Gmail accounts, you have to enable less secure apps in the Google settings, see also Why do I get AuthenticationFailedException when accessing Gmail?. 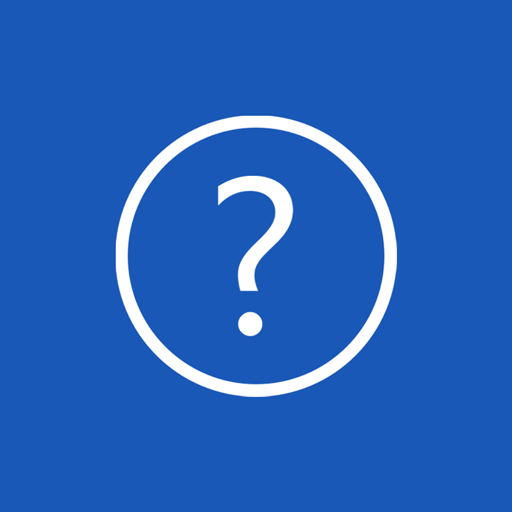 Probably you want to read this first: What is SMTP? This extension uses the Javamail API version 1.5.5. Thank you Oracle! Returns from (i.e. the email address of the sender of a message). Specifies from (i.e. the email address of the sender of a message). Specifies SMTP host. Default value is smtp.gmail.com. Specifies SMTP port. Default value is 465. Returns whether text should be sent in HTML format. Specifies whether text should be sent in HTML format. Default value is false. Subject and To address are mandatory. For To, Cc and Bcc you can add several addresses, use a comma as delimiter. Also you can add several attachments, use a comma as delimiter. You can't send attachments from the assets of the app. Event indicating that email has been sent. In case of success, the flag successful is true and the text "success" will be provided as response. In case of failure, the flag successful is false and an error message will be provided as response. 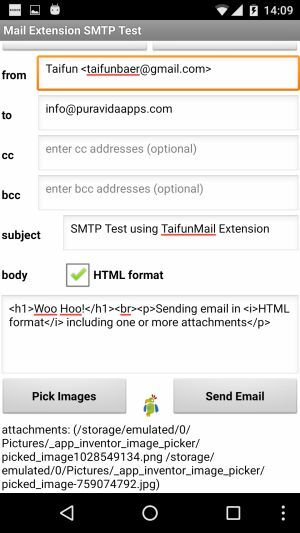 Enter your settings and send emails to several To, Cc or Bcc addresses, add several attachments and send in plain text or HTML format to test the functionality of the Mail extension. Q1: When I tried the .apk it gives as response javax.mail.AuthenticationFailedException 534-5.7.14? A: To use this extension together with Gmail accounts, you have to enable less secure apps in the Google settings, see also Why do I get AuthenticationFailedException when accessing Gmail?. Q2: Would you be able to assist me with the file location needed to send a different file in my test I am using ///storage/emulated/0/Folder/File.txt? A: You can use a full path, which is file:///mnt/sdcard/Folder/File.txt or a relative path, which is /Folder/File.txt. Q3: I have tried Mail Extension SMTP, it works with GMail, then I tried with another SMTP account (not GMail) and I received the following error message: javax.net.ssl.SSLHandshakeException: java.security.cert.CertPathValidatorException: Trust anchor for certification path not found. A: It seems to be, your server is not correctly configured, see also this stackoverflow answer. Please contact your server administrator. Q4: I have tried Mail Extension SMTP, it works with GMail, then I tried with another SMTP account (not GMail) and I received the following error message: javax.net.ssl.SSLHandshakeException: Handshake failed. We do not use any security settings. Can I disable SSL auth so I can use my SMTP server? A: Please configure your server accordingly and use SSL, insecure methods are not supported by the extension. Q5: You said that: you can add several attachments, use a comma as delimiter. You can't send attachments from the assets of the app. What do you mean exactly with "the assets of the app"? A: Assets are all files, you uploaded as media into your project. To send a file from the assets, you first have to copy it to the internal sdcard and send it from there. To copy a file from the assets to the internal sdcard please use the file extension and its Copy method. 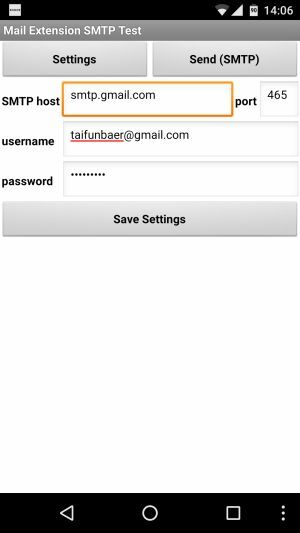 Q6: I'm using a Gmail account to send emails and some user get an error message and the message will not be sent? A: Thank you for your test. It seems to be, the extension does not work together with port 587 and STARTTLS. I will put this onto my to do list and probably will add this feature one day. Thank you again. A: Dear Fernando, especially for you I now prepared a very simple example project, which you now also can find in the download folder to download. I recommend you to do the tutorials to learn the basics, see also here. Please no CAPS LOCK next time. Thank you. please ask in the App Inventor forum.Thank you. Follow the opt-in URL to get access to the app and to be able to download it to your device. It might take a few hours for Google to enable you as beta tester! You can buy this extension (aix file). With your payment you accept the terms and conditions below. After having received your payment I will be happy to send the download link to you. Please let me know your Google account! I usually will send the download link not later than 24 hours after having received your payment. You are buying a digital product and agree to the No Return, No Refund Policy. You have tested the example app successfully on your device before buying the extension. This is a single user license for you as App Inventor developer, which means, the extension (aix file) is only for you to use. You are not allowed to pass the extension (aix file) to someone else. In case you are interested in a multiple user license, please contact me by email. There are a lot of different Android devices available in the market. I'm not able to test the example on all these devices and therefore also can not guarantee, that the example is running on your device. Site Content © 2018 Pura Vida Apps using the Foundation Framework. Portions of this page are modifications based on work created and shared by Google and used according to terms described in the Creative Commons 3.0 Attribution License. Android is a trademark of Google Inc.